On May 10, H.E. 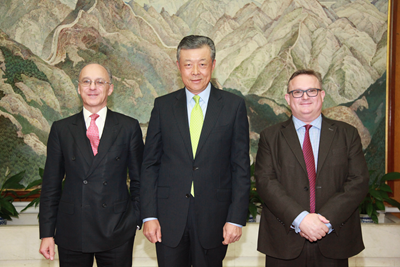 Ambassador Liu Xiaoming met with Lord Sassoon, Chairman of the China-Britain Business Council (CBBC), at the Embassy. Others at the meeting included Stephen Phillips,Chief Executive of CBBC, Minister Counsellor Chen Wen, and Jin Xu, Minister Counsellor for Commerce of the Chinese Embassy. Lord Sassoon said that among the various circles in the UK, there is a strong interest in the upcoming Belt and Road Forum for International Cooperation. In the past two years, CBBC issued two reports: one is on how China and the UK could work jointly to build the "Belt and Road", and another is a case study analyzing the cooperation of UK and Chinese firms on the initiative. This year, CBBC will publish a third report concerning the "Belt and Road". All these fully demonstrate CBBC's emphasis on and support for the "Belt and Road Initiative" and highlight the great potential and prospect for cooperation between the two countries. He is convinced that the Forum to be held in Beijing will achieve a complete success and create strong impetus for China-UK cooperation. Ambassador Liu spoke highly of CBBC's efforts in promoting China-UK cooperation in economy and trade and its contribution to the bilateral cooperation under the "Belt and Road" initiative in the past years. He noted that China regards the UK as an important partner to promote the "Belt and Road" initiative, and looks forward to more fruitful results. CBBC, an official partner of UK's Department for International Trade, is a non-profit institution supported by the British government and business community and committed to developing economic and trade relations with China. With its predecessor being the 48 Group and Sino-British Trade Committee established in the early 1950s, it now has nearly one thousand corporate members and has offices in 15 Chinese cities and 11 British cities.